To integrate with Slideshare, follow the directions in this article in the App Center - it will guide you through the first part of your integration. You are now connected. Please note, you can only connect slideshare as a primary destination to content types with Document body types. If you want to send over data like description or tags with your document, you need to set up specific custom fields for the Slideshare post type. First you will need to go into your instance settings and click on the custom fields tab. You can "create" a new custom field at the bottom of this page. You will need to repeat the same steps for Slideshare Tags. The Field Name will be "kapost_slideshare_tags". If you wish to control whether your posts are published publicly or privately, you will need to set up a custom field for this as well. 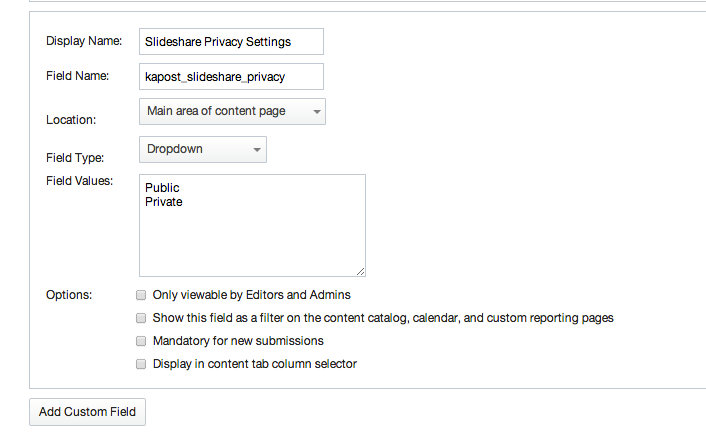 The field name for this field should be "kapost_slideshare_privacy" and the Field Type should be "Drop down." You will need to make the drop down values "public" and "private." Feel free to contact support at kapost dot com if you have any questions about your Slideshare integration.